Fishtails and Pearls: What do you like to eat at 36,000 feet? What do you like to eat at 36,000 feet? I love Terminal A in Boston. It's new and has a few good spots where you can eat, or get some good food to take on your flight. 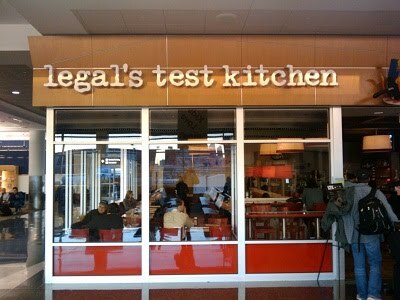 My favorite is Legal's Test Kitchen (LTK) which is a scaled down version of the Boston favorite, Legal Sea Foods. Both restaurants live up to the Legal Sea Foods tag line, "If it isn't fresh, it isn't Legal." Here's a peek at the LTK menu. 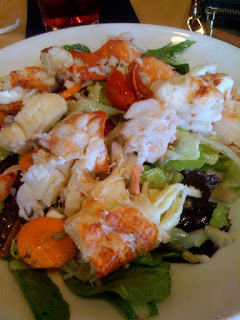 I always order the garden salad with fresh lobster meat. It's not on the menu, but they're always happy to oblige. I've tried to veer into other areas of the menu, but haven't succeeded yet. They also serve delicious burgers (natural beef from Niman Ranch), chowder, and an array of prepared sandwiches and salads. It nice that airports are hosting higher caliber restaurants where we can enjoy some really nice food. If we're forced to haul our own food on board, it might as well be tasty. My lobster salad is usually the envy of my seat mates. Enjoy one next time you find yourself in Terminal A. LTK is a quick right just after you go through security. There's also LTK in the Seaport area of Boston. Oh, and if you find yourself in Terminal C there's a Legal Sea Foods in the main gate area. So what do you like to eat at 36,000 feet?